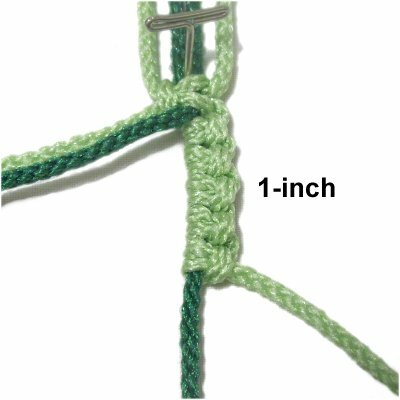 Description: The Double Buttonhole Stitch is a vintage pattern made with the Vertical Larks Head Knot. 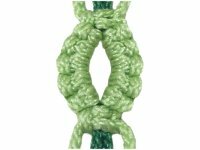 The Square Knot is also part of the design. 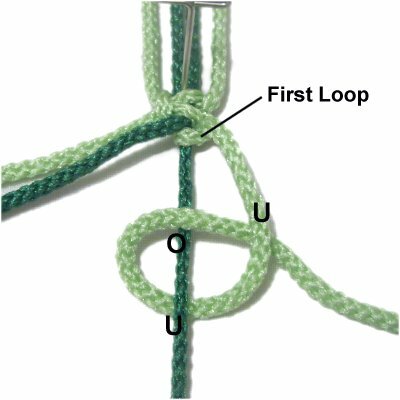 In the early days of Macrame, the Larks Head was called the Buttonhole Knot. It was named that because it was frequently used in patterns that require buttons, such as vests. This type of buttonhole design can be used for necklaces, bracelets, belts and handbags. It does not have to be used as a clasp. The overall design can be made with this technique (see bracelet below). The Buttonhole Clasp is a similar technique that you should practice after you are done here. Click on the link or image to visit the page. The Buttonhole Bracelet is made with the Buttonhole Clasp as well as the Double Buttonhole. Click on the image or link if you wish to give it a try, after you have practiced. To practice, you need two 18-inch holding cords and two 36-inch working cords. In the example shown below, the holding cords are dark green. Secure them to your project board vertically. The holding cords should rest between the working cords. Make sure they have tension. Mentally number the cords 1- 4. The working cords are 1 and 4. Pass working cord 1 over the fillers (2 - 3) and under working cord 4, heading left to right. Pass working cord 4 under the fillers and over working cord 1, heading right to left. 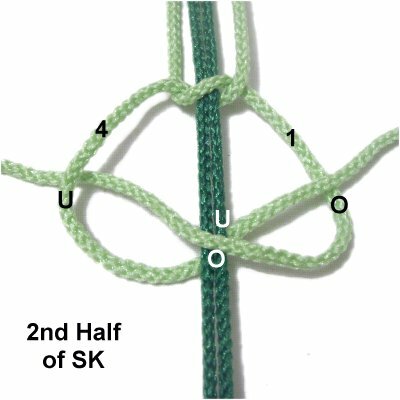 Step 2: Tie the second half of the SK. The instructions are the same as in step 1. The cords have switched places, so the direction is reversed. 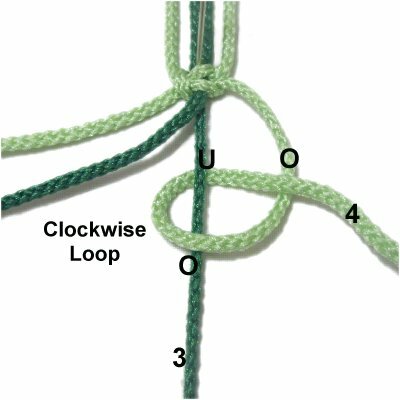 Step 3: Tie a clockwise loop with working cord 4, passing over - under cord 3. As you pull it right, pass over cord 4 to complete the loop. 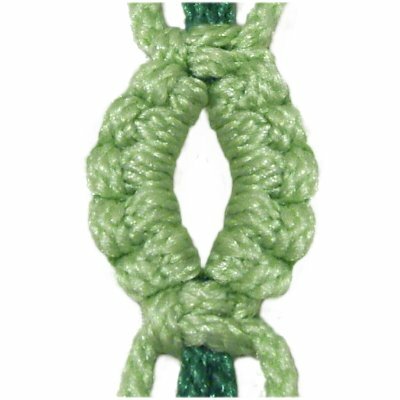 Tighten the knot firmly, so it rests against the Square knot. 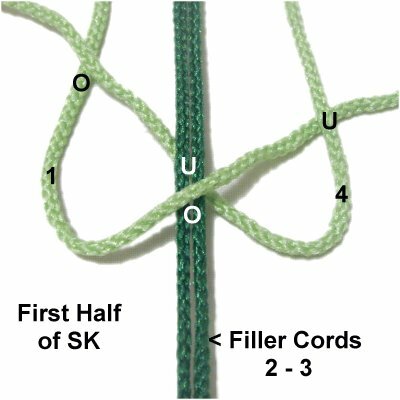 Step 4: To complete the Larks Head knot, pass working cord 4 under - over cord 3. Pull it right, passing under cord 4. Tighten firmly. Steps 3 + 4 = one Larks Head knot. Step 5: Repeat steps 3 and 4 several times, until the Larks Head sennit is 1-inch long. When using the Double Buttonhole Stitch in a Macrame project, the length of these sennits will depend on what you are making and the size material you are using. Step 6: Repeat Steps 3 - 5 to create another Vertical Larks Head sennit on the left. 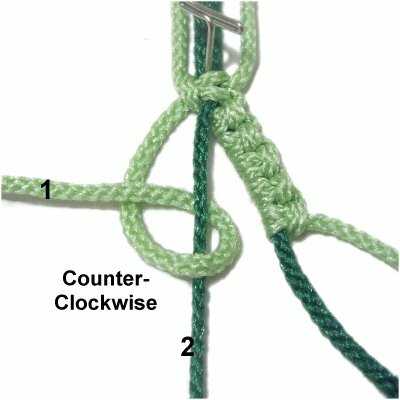 Use working cord 1 to tie the knots onto cord 2. Rotate counter-clockwise to make the loops. Step 7: Push the Larks Head knots close together to eliminate extra spaces. 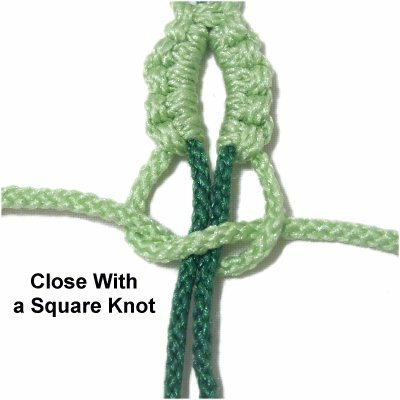 Repeat steps 1 and 2 to tie another Square knot with the working cords, closing the Double Buttonhole Stitch. Have any comments about the Double Buttonhole Stitch? Contact Me.